Bacon Pretzel Chocolate Chip Cookies are a sweet chewy chocolate chip cookie filled with little surprise bites of salty pretzels and bacon. I should call these Bacon Pretzel Chocolate Chip Cookies the Happy Couple Cookie because there are bits of bacon and pretzels for the men and chocolate for the ladies. It’s the best of both worlds all mixed up in a gooey cookie goodness. I think Ruth Graves Wakefield is on of my top 10 list of favorite people because she invented the chocolate chip cookie. Ruth owned Toll House Inn, in Massachusetts, a very popular restaurant that featured home cooking in the 1930s. 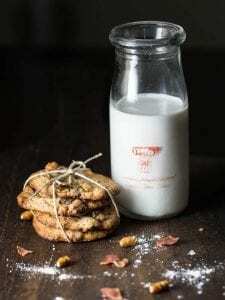 She published a cookbook, Toll House Tried and True Recipes, which had in it the recipe for Toll House Chocolate Crunch Cookies. This recipe quickly became America’s favorite cookie. American’s are passionate about their chocolate chip cookies, with so many families believing their grandma had the best recipe. For my Bacon Pretzel Chocolate Chip Cookies, I start with my all time favorite recipe that I cut from an M&M bag back in 1993. The recipe is worn, stained and has been taped with a large piece of clear packing tape to my recipe card for preservation’s sake. 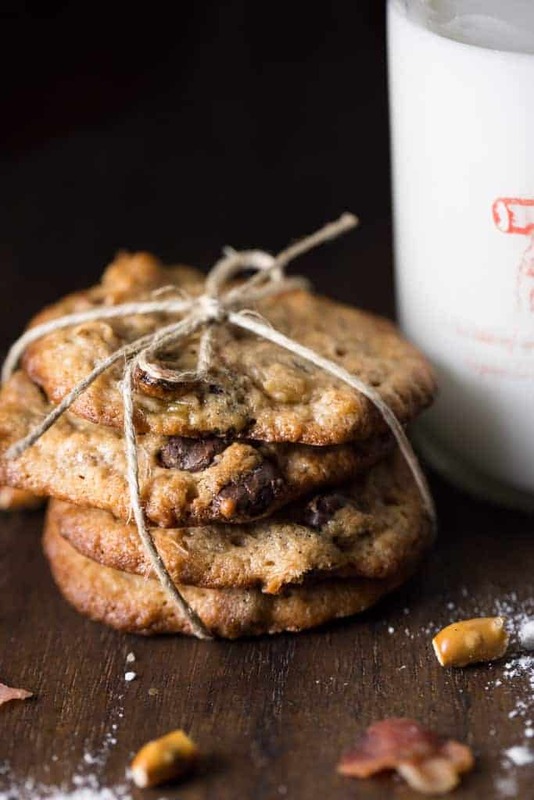 Warm memories of pulling this recipe out late in the evening when all my little kids had been tucked into bed so my teens and I could eat warm cookies and cold milk in peace. In a small bowl, combine flour, baking soda, and salt, set aside. Drop by heaping teaspoonfuls about 2 inches apart onto an ungreased cookie sheet. I feel like adding pretzels to cookies is always a good idea but pretzels + bacon is so much salty goodness! Yum. Definitely a milk of glass needed with these!